← 2012 in review – This Site! Singapore – Whether you’re a dog person or cat lover, a soccer or basketball fan, you’re invited to take part in a unique multimedia contest that brings opposites together to change the world. ONE, a 3 million-strong global advocacy organization that fights extreme poverty and preventable disease, and iStockphoto, the web’s favored source for user-generated imagery and multimedia, are partnering with Zooppa to launch a competition today in order to raise awareness of the plight of the world’s poorest citizens. Entrants will be judged based on adherence to the spirit of the brief, creativity, production value and whether the submission is compelling and engaging. Judges will include: Tom Freston, ONE Chairman of the Board and former CEO of Viacom and MTV Networks; Andrew Saunders, Getty Images Senior Vice President of Creative Imagery and Product Development; and Jeff Davidoff, ONE Chief Marketing Officer. The winner will be announced during the annual SXSW music, film, and interactive conference in Austin, Texas in March 2013. Twelve winners in total – six video winners and six print winners – will share $20,000 dollars and 35,000 free credits from iStockphoto. Winners will also be featured at ONE’s live events, on its website and social media platforms. 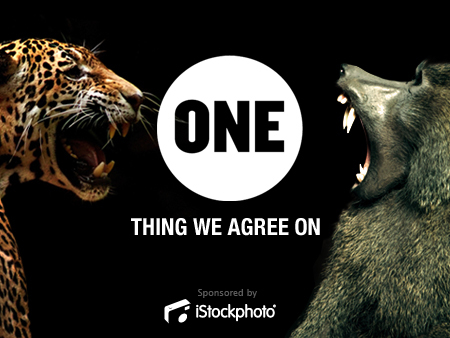 As part of an exclusive sponsorship, iStockphoto will provide the first 500 entrants with free credits to license high-quality, imagery, footage and audio from iStockphoto for use in their “ONE Thing We Agree On” submissions. ONE is a global advocacy and campaigning organization co-founded by Bono and backed by more than 3 million people from around the world dedicated to fighting extreme poverty and preventable disease, particularly in Africa. For more information please visit http://www.ONE.org. iStockphoto offers easy, affordable inspiration with millions of hand-picked, royalty-free photos, illustrations, videos and audio tracks. Using the most advanced search in the business, customers download a file every second from a collection of more than ten million files for business, marketing and personal projects. iStockphoto started in 2000, pioneering the micropayment photography business model, and has become one of the most successful and profitable user-generated content sites in the world. iStockphoto pays out more than $1.7 million weekly in artist royalties. iStockphoto is headquartered in Calgary, Alberta, Canada, and is a wholly-owned subsidiary of Getty Images. Zooppa.com is the world’s leading creative crowdsourcing platform. Over 100 leading brands and their agencies work with Zooppa to create fresh, on-brief content, including videos, prints, music and concepts. Zooppa is based in Seattle with 200,000 members around the world. This entry was posted in Photography Articles & Videos, Photography Contests, Uncategorized and tagged Contest, iStock, ONE, Zooppa. Bookmark the permalink.